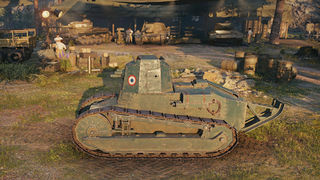 Der Renault FT 75 BS ist ein französicher Selbstfahrlafette der Stufe 2. Eine Selbstfahrlafette mit der kurzläufigen Blockhaus-Schneider-Haubitze vom Typ S im Kaliber 75 mm, eingebaut in einen gepanzerten Kampfraum. Die Haubitze war größer als vorherige Geschütze, erhöhte das Gewicht des Fahrzeugs auf 7,3 Tonnen und verringerte den Munitionsvorrat auf 30 Granaten. Das Oberkommando fand Gefallen am Projekt und orderte 970 Fahrzeuge. Bis zum Ende des ersten Weltkriegs wurden 39 Fahrzeuge gebaut, danach wurde die Produktion eingestellt. Es gibt keine verlässlichen Quellen über einen Einsatz dieser SFL in den 1940ern. Einige Fahrzeuge nahmen jedoch an Gefechten in Nordafrika teil. Zwei Selbstfahrlafetten wurden bei der Operation Torch von den Alliierten erbeutet (USA, GB, Frankreich). Since the SU-18 was the SPG variant of the MS-1, itself the soviet version of the Renault FT, this tank is extremely similar to its Russian counterpart. It has a short range, fast RoF and aim time and the same mobility as the FT-17, which puts it on par with the other tier 2 SPGs. 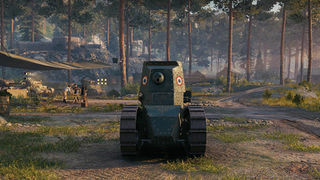 Der Renault FT 75 BS führt zum Lorraine 39L AM. Small size makes hiding easier. 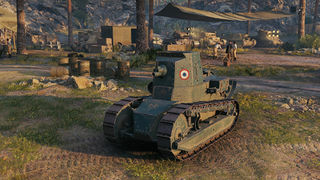 The first French SPG can be a rather fun experience for new players that want to try out the artillery side of the game. It aims faster than the other tier 2 SPGs, which is helpful to all players, but especially to players new to SPGs. Its second engine upgrade makes it pretty maneuverable and has decent acceleration. It also has great accuracy and a quick reload time for an arty. Keep in mind that just like the Soviet SU-18, the range isn't that great, the top speed is terrible, and small obstacles like fences or trees can stall or slow down the tank. Also, it only has two crew members and a rather limited ammo capacity. It also plays well as a Tank Destroyer due to its great gun depression. However, don't do this unless the situation is extreme. This tank can easily relocate after a shot, but don't expect to be crossing the battlefield anytime soon. The shell has a rather long travel time so you need to time properly when aiming at other tanks, specially when they are on the move. This tank can easily take advantage of the Camouflage Net as it has rather small profile. Should you decide to keep this on your garage, the Gun Laying Drive will make your aiming lightning fast! 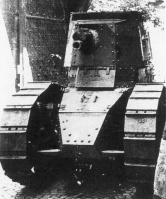 The engines carry over from the Renault FT, so upgrade the engine immediately. Research the suspension and the radio. The Char Renault FT BS was a self-propelled gun mounting a 75mm Blockhaus Schneider L9.5 short-barreled howitzer in a seven-sided riveted superstructure that replaced the turret. Since new superstructure was significantly bigger then the previous turret, the vehicle's weight was increased to 7.2 tons. Due to the size of the gun, ammunition storage was reduced to only 30 rounds, a rather small number considering standards of its time. The army was satisfied with the design and an order was placed for a total of 970 units. Unfortunately, due to the Armistice in in 1918, only 39 vehicles were completed before all further production was cancelled. There are no data concerning possible usage in France during 1940, but some combat service has been recorded during interwar period in North Africa. At least two vehicles were captured by the Allied forces during operation Torch. Diese Seite wurde zuletzt am 25. Oktober 2016 um 13:33 Uhr geändert.